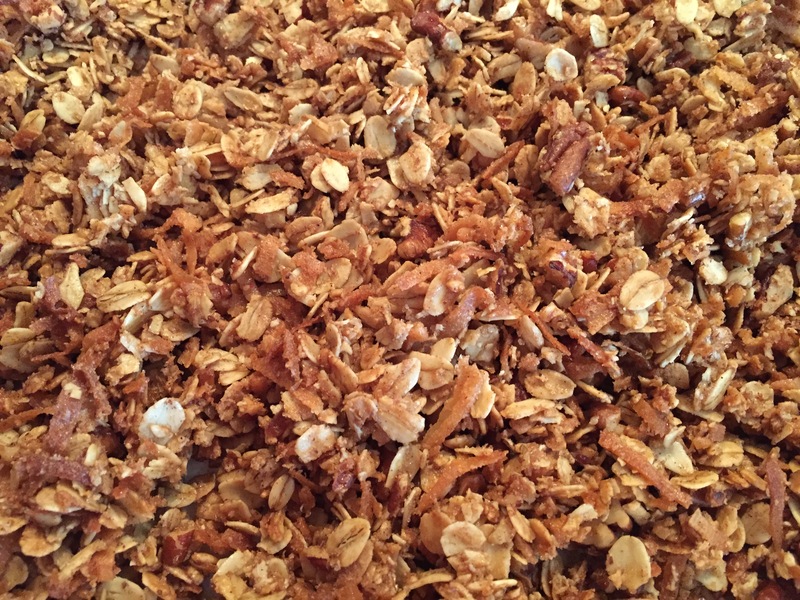 This homemade granola definitely falls under my “tried and true” category and as noted above, is my “go-to” recipe. The spices and flavors all meld together so perfectly and it smells wonderful when it’s baking. It’s good as is, in a bowl with milk, or added to yogurt. Preheat oven to 325 degrees. Line a large baking sheet with parchment paper or a silicone baking mat. Depending on how big the baking sheet is, you may have to bake it in two batches. In a large bowl, mix together the oats, coconut, pecans, and spices. Pour coconut oil and maple sugar over mixture, stir well until thoroughly coated. Spread evenly onto the prepared baking sheet and sprinkle with brown sugar. Bake for 15 minutes, remove from oven to stir, flip, and rotate pan. Bake for another 15 minutes until golden brown. Once cooled, break apart larger pieces into smaller ones. Store in an airtight container. This entry was posted in Breakfast, Granola. Bookmark the permalink.